Okay so I've never been shy about sharing my love of snacks. So I'm just going to put it all out there...I LOVE Crunchies! So much so I actually hid a few packages of them for myself just so the kids wouldn't get ahold of them. I know terrible mom alert right? But they are just that good. The first package we opened as a family was the cinnamon apple and oh my goodness they tasted so good. All I could think was how could these really be good for us and taste so good? Now I can't seem to get enough of them and neither can the kids. They are perfect back to school treats that I don't have to feel guilty about letting them snack on while I'm preparing dinner either. I love that it's just simply freeze-dried fruit, nothing extra added. Because of the method they use to preserve them you actually get the real fruit flavor when you're eating them. Unlike many dehydarated foods that lose their original sweet flavor Crunchies do not. They are just as tasty as the day they are picked! Unlike traditional heat drying, the freeze-drying method used by Crunchies ensures that fresh fruit and veggies retain their nutritional value while enhancing shelf life—and creating that satisfying crunch. After harvesting, fresh produce is promptly frozen and undergoes a low-pressure drying process in which frozen water is removed directly as steam, bypassing the liquid state. As a result, Crunchies products retain most of the nutrients of fresh, whole fruits and vegetables, making them a smart food choice for consumers of all ages. Plus, each serving of Crunchies is only around 40 calories. 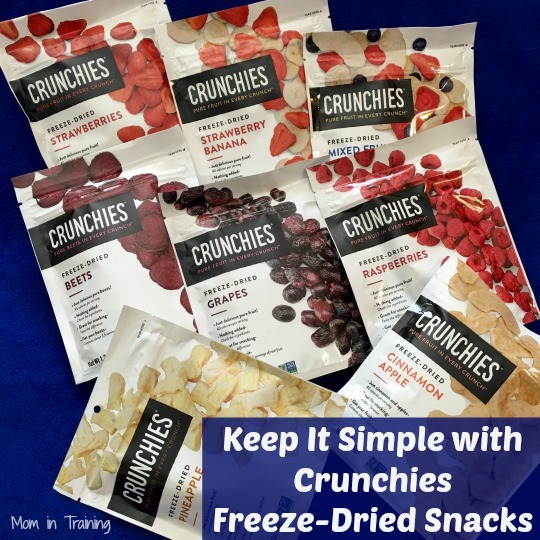 Crunchies’ line of single-ingredient snacks has zero sugar added and is non-GMO, gluten-free and vegan, meaning that moms & dads can feel confident knowing that these delicious freeze-dried fruits & veggies are as good as they taste. Enjoyed straight from the bag, Crunchies Grapes are a wholesome alternative to raisin boxes (we call these “nature’s candy”). Or try adding Pineapple to your favorite granola recipe for a sweet Pina Colada treat (minus all those calories! ).